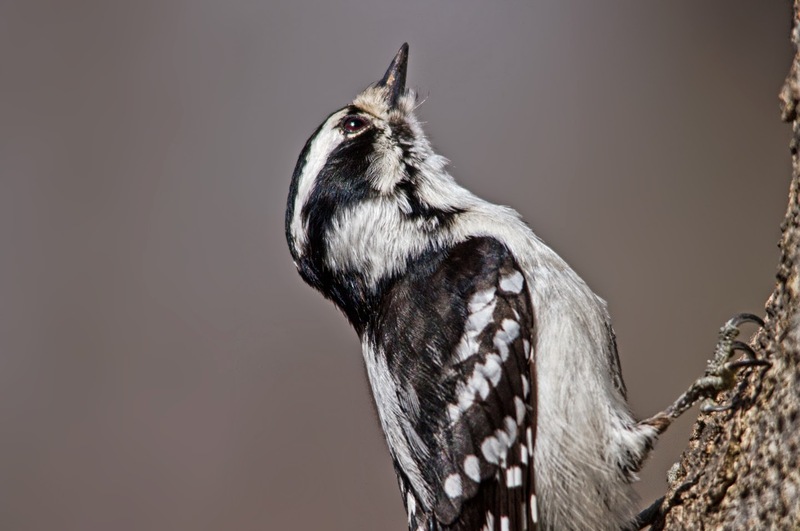 Here's a very "glam" shot of a female downy woodpecker. If woodpeckers had been movie stars in the golden age of the studio system, this would do for the cover of a fan magazine. This set of reflections in Chicago is a nice monochrome complement to those bright red chairs from Wednesday: small patterns, repeated. 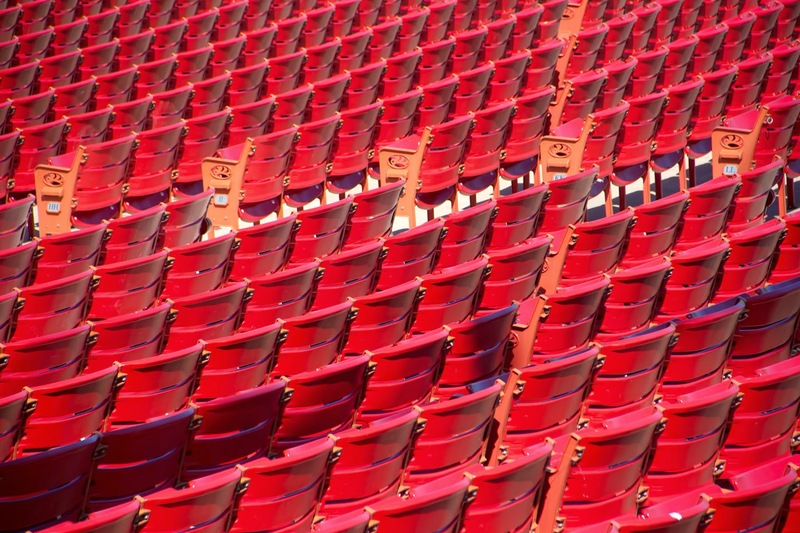 The seats at the Pritzker Pavilion bandshell in Millennium Park in Chicago. This exotic moon is a true color rendering of Jupiter's moon Io from 1999. 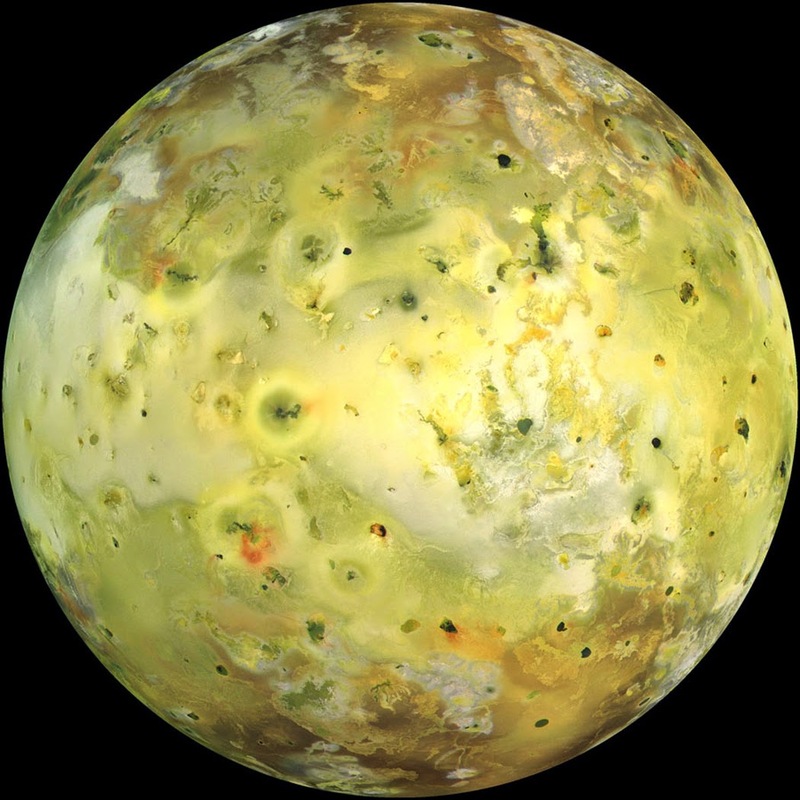 It's the most geologically active object in the solar system, with over 400 active volcanoes, and the sulfur and sulfur dioxide they emit gives Io that startling yellow color. 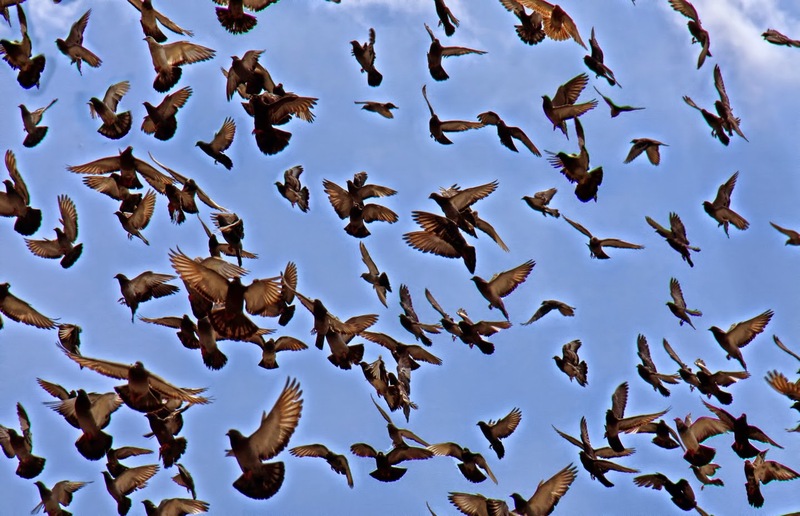 People tend to dismiss them as "rats with wings" but when they fill the sky out of nowhere like this, a tornado of wing and tail, they're as beautiful as any other bird. I think those pigeons only appear in dreams (or poetry). In my experience, there's very little undulation, ambiguous or otherwise. Mostly a lot of wild flapping. A brief acknowledgement of the solstice, and a welcome back to the sun, which will be residing in the Northern Hemisphere for the next six months. 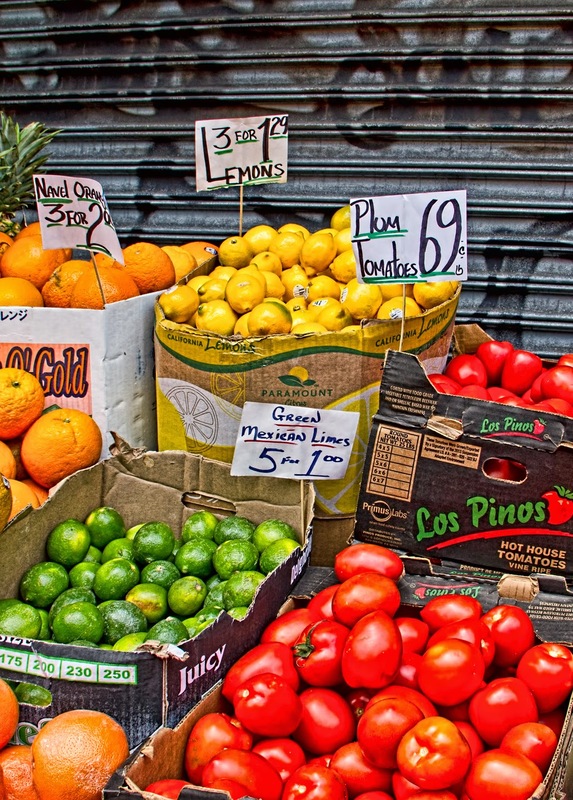 The farm stands are back, along with the Saturday pickle man on 43rd Street, and despite the long, evil winter, which had to have been even more discouraging to plants than it was to the rest of us, there are already good tomatoes and even some early peaches in the markets. 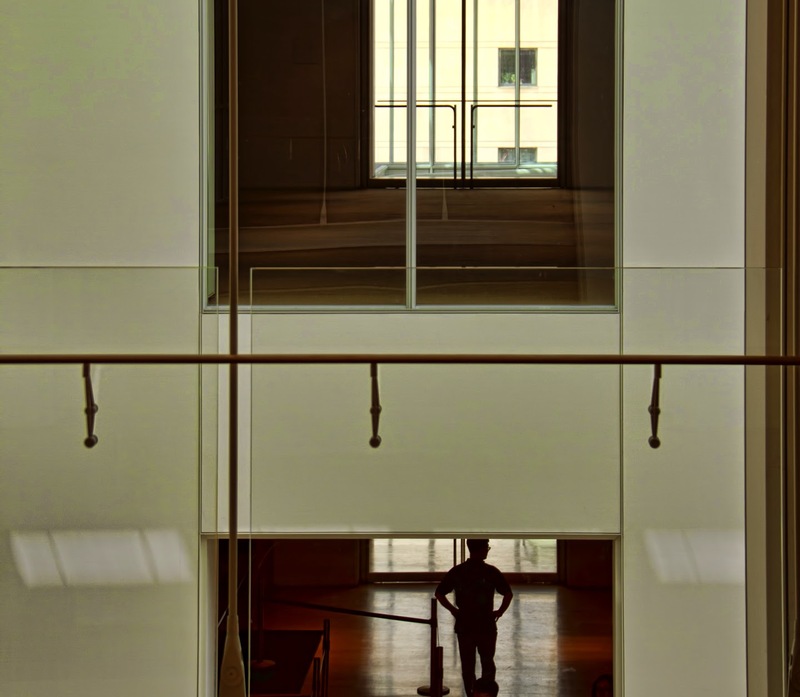 Here's something a little different for Saturday -- a split-level view from the Art Institute. 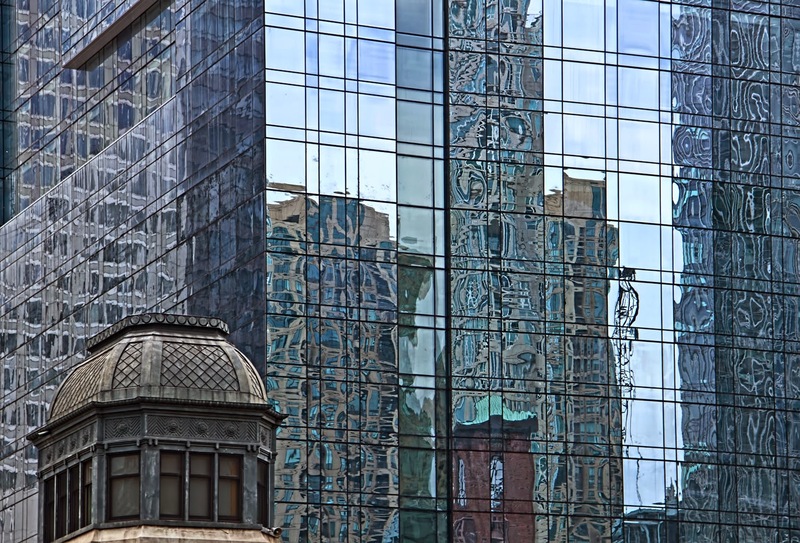 I have enough pictures of reflections from Chicago to supply weekly postings for the next several years. 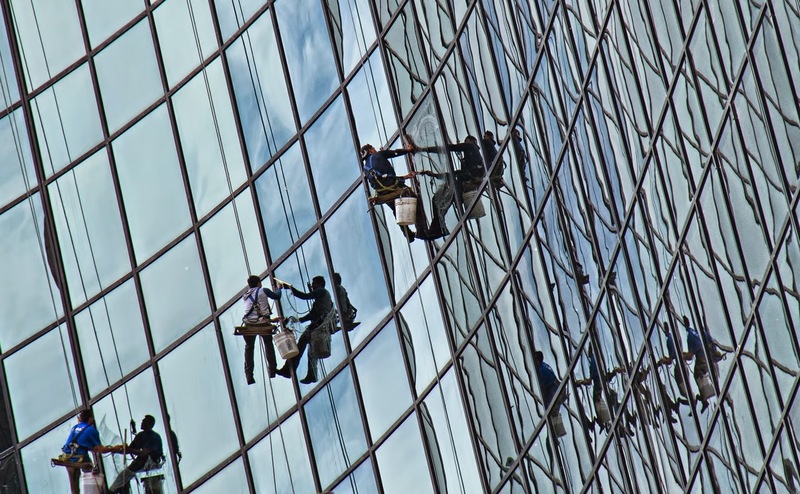 There are some reflections in this picture, but what I really like here are all the lines and rectangles, especially the squares within squares of a window seen through a window seen through a window. And the silhouette of the man with his hands on his hips is the perfect finishing touch. 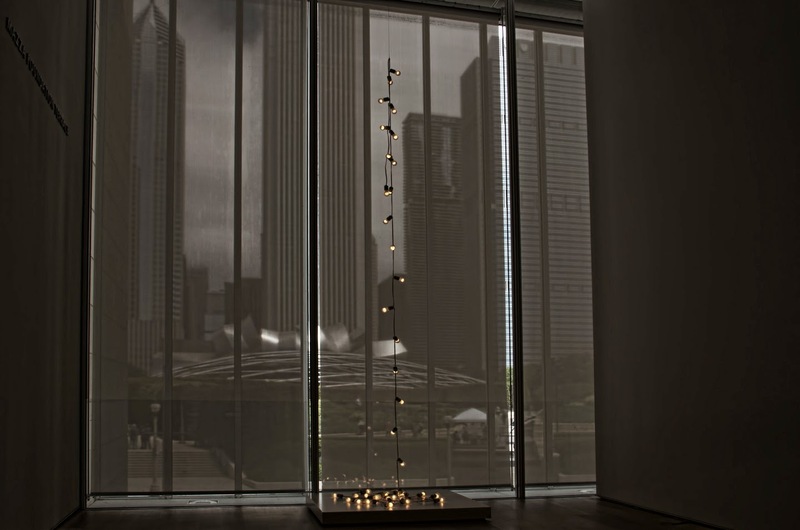 Chicago, seen through a curtained window at the Art Institute. I deliberately kept this one dark because I like the way the moody background plays against those hanging lights. 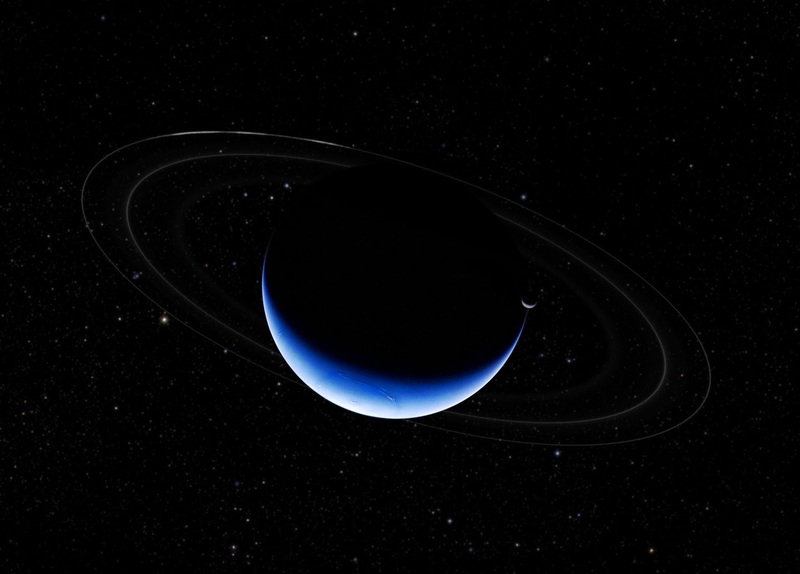 A beautiful composite image of Neptune from pictures taken by Voyager 2 in 1989. You can see the rings as faint arcs of light, and the moon Triton just above the right side of the planet's crescent. Another look at our heroic men in harness. Just because I really like how these pictures came out. 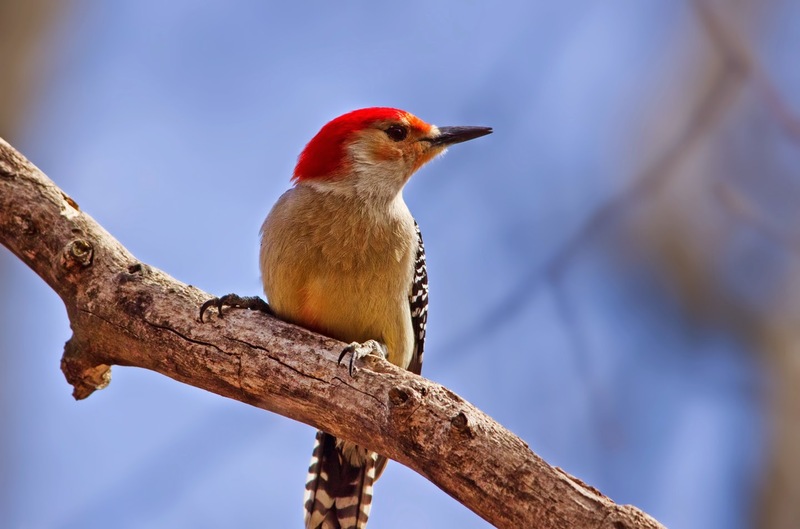 Here's one of the natives, a red-bellied woodpecker in Central Park. 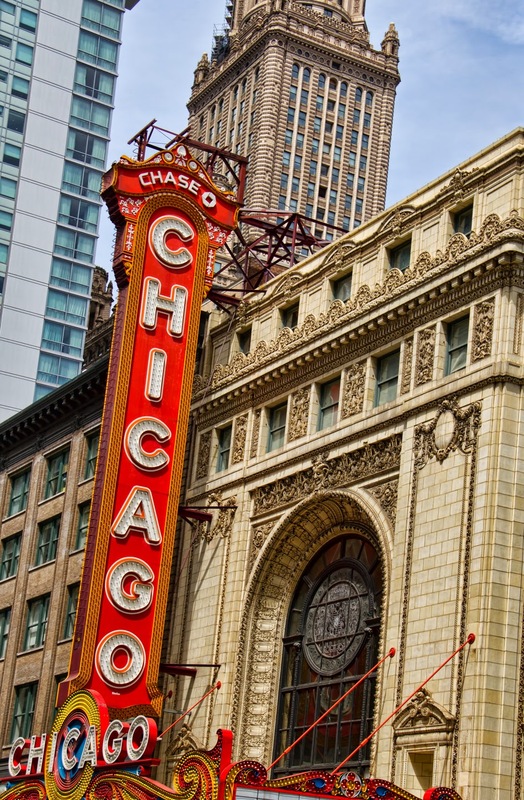 Chicago, of course. It's full of fun juxtapositions, like this weathered ornate cupola in front of the sleek modern glass. When I take many pictures on a trip -- well, when I take a trip, because I always take many pictures -- I catch up by backdating the posts to the date I actually took the picture. 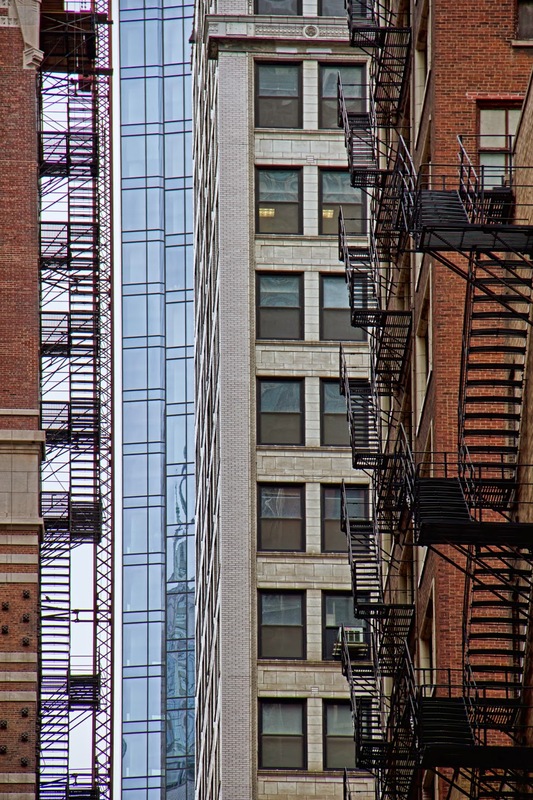 And I'll probably be adding more pictures to last weekend's Chicago Story, but here are two out of sequence. 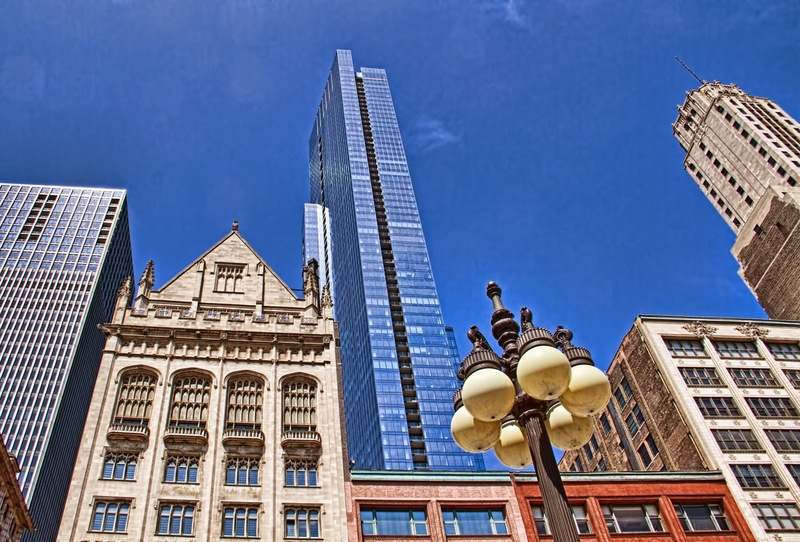 So many of the pictures I took featured one, or two, buildings, soaring against blue sky as though they alone were the skyline. I like these two pictures because they give the context, the way the towers are shoved up against the river, the bustle and busyness of the many bridges, the boats on the water. It's a city, not a museum of architecture. 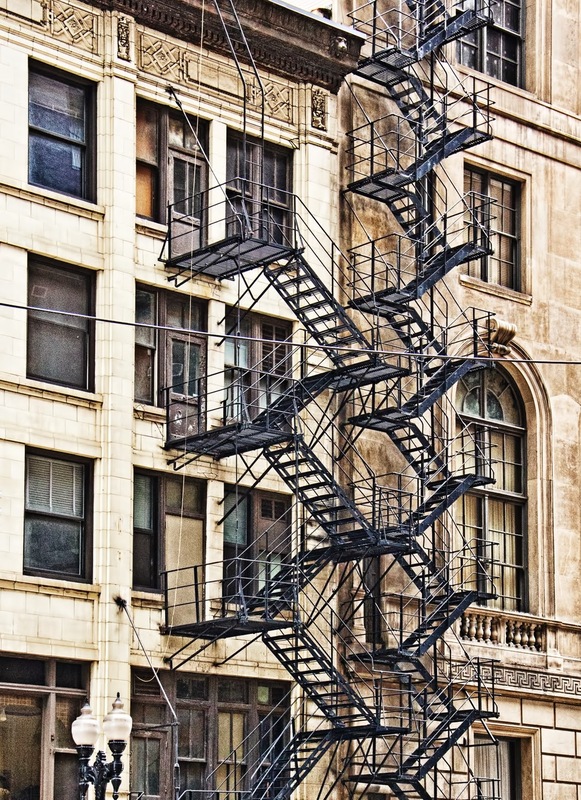 Another great pair of fire escapes in Chicago. It looks as though they're dancing with each other. Even universes were children once. This is the latest version of the Hubble Ultra-Deep field, looking at a tiny section of the universe in the constellation Fornax, picked because there weren't many closer stars in that direction to obscure the view. 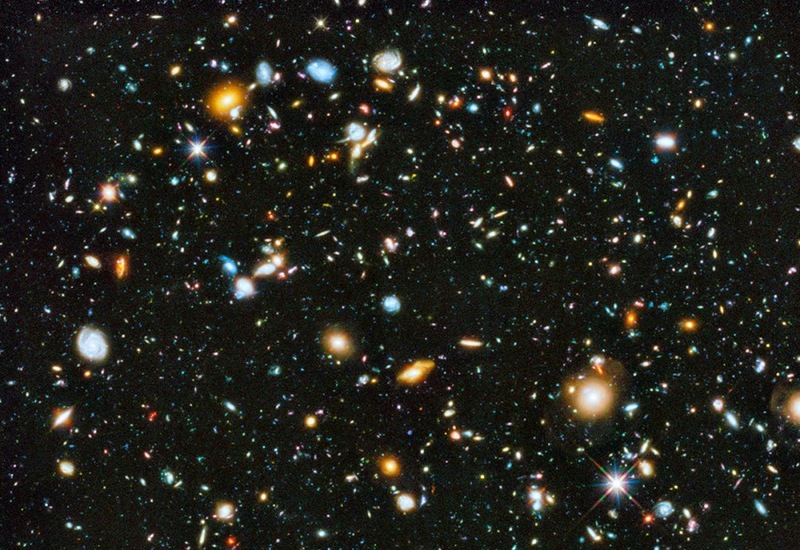 This image contains an estimated 10,000 galaxies, approximately 13.2 billion light years away, so only a few hundred million years after the Big Bang. Usually pictures of planets and galaxies inspire a sense of awe. Or wonder. Or curiosity. But these lights, each comprising millions of stars, just make me want to dance along with them. And giggle. And sing. We are meant to be joyful! I made it back from Chicago without any drama, and was settled on my bed, remote in hand, by the time the Game of Thrones opening theme finished playing. 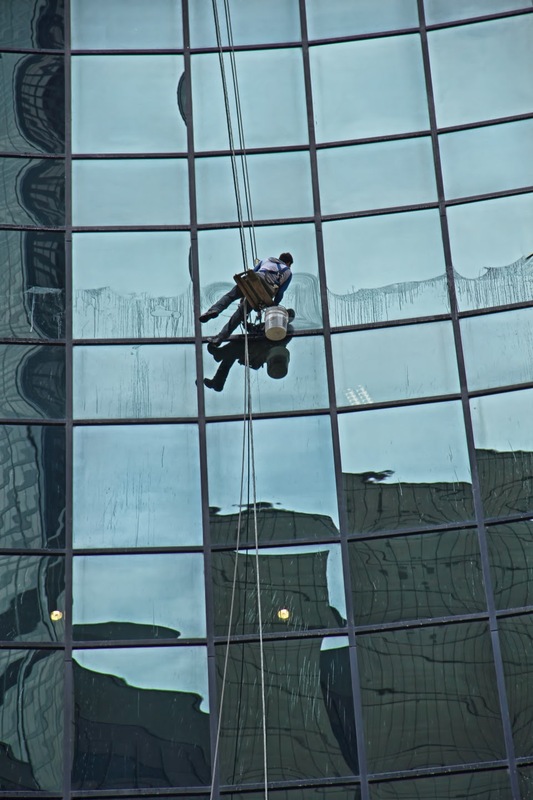 I have many more pictures that I will go back and post, but in the meantime, let's hear it for the brave men and women who made Mies van der Rohe and modern architecture possible: window washers. 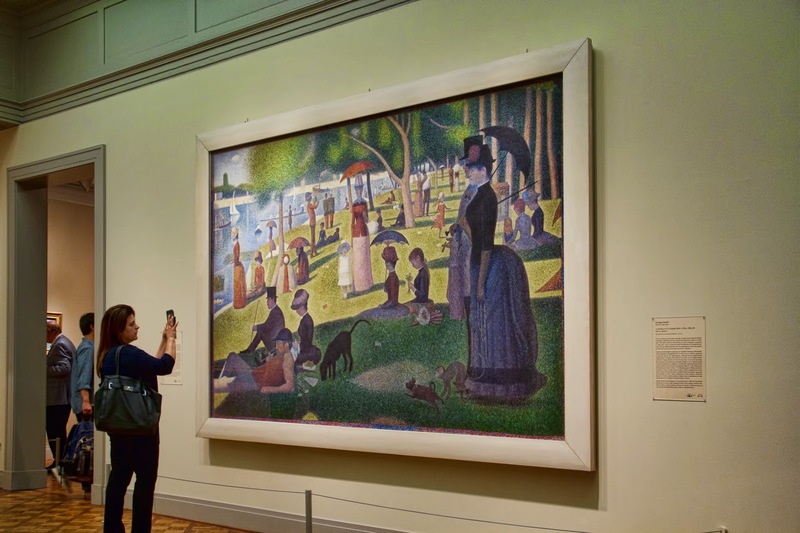 Someone had mentioned the new Broadway show Sunday in the Park with George, and Laurie said it was based on a painting at the Art Institute, which was also called Sunday in the Park. I said that, No, the painting was called Sunday on La Grande Jatte, which was an island in the Seine. No, I was wrong. She'd gone to the Art Institute of Chicago hundreds, no, thousands, of times, and she knew the painting well and it was called Sunday in the Park. I admitted that I had never been to the Art Institute, and had not seen the actual painting, but I'd studied it in art class, and I knew what it was called. Eventually, like most arguments in the pre-Google era when nothing could be proven one way or another in the moment, we forgot about it and started talking about something else. But I remembered it today, when I finally stood before the canvas of discord myself and confirmed that yeah, it's La Grande Jatte. And sensed that Laurie, somewhere, was marshalling an argument to the effect that while yes, Sunday on La Grande Jatte may have technically been the correct name, if we're going to assume that the name printed on the little card hanging on the wall next to it has some kind of official standing, but that's not what the painting is actually called. If you said La Grande Jatte to anyone in Chicago they wouldn't have any idea what you were talking about. The painting is called Sunday in the Park. 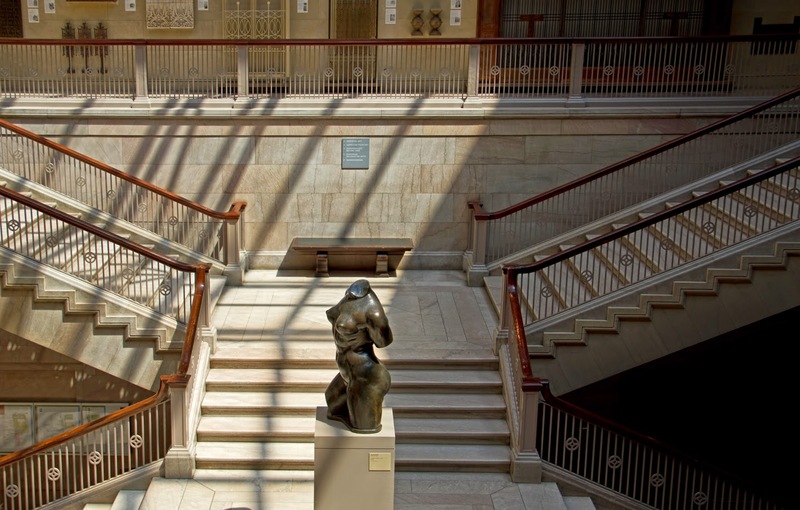 You have to like a museum that would put that saucy torso in the middle of its very proper Grand Staircase. And though I overdose on Impressionism pretty quickly -- I thought I had already seen most of the Renoirs there are to be seen; apparently I was wrong -- I did like the Art Institute very much. Though I admit that I spent most of the last hour before I had to leave for the airport outside, having a coffee in the garden. 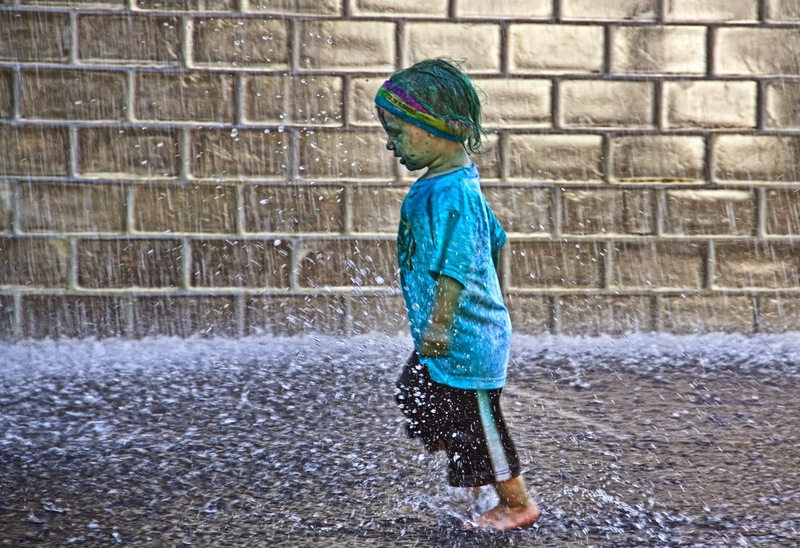 Obviously the Crown Fountain is the place to go if you've just had your face painted and want to make sure your hair turns green as well. I saved the visit to the Art Institute for my last day because it was supposed to rain. Instead it was just those damn blue skies and comfortable temperatures again! I would have been happy just spending a few more hours in Millennium Park and I definitely took the long way around walking to the museum. I thought I would have to skip bird blogging this week as I saw very few birds that weren't flying away while I was in Chicago. 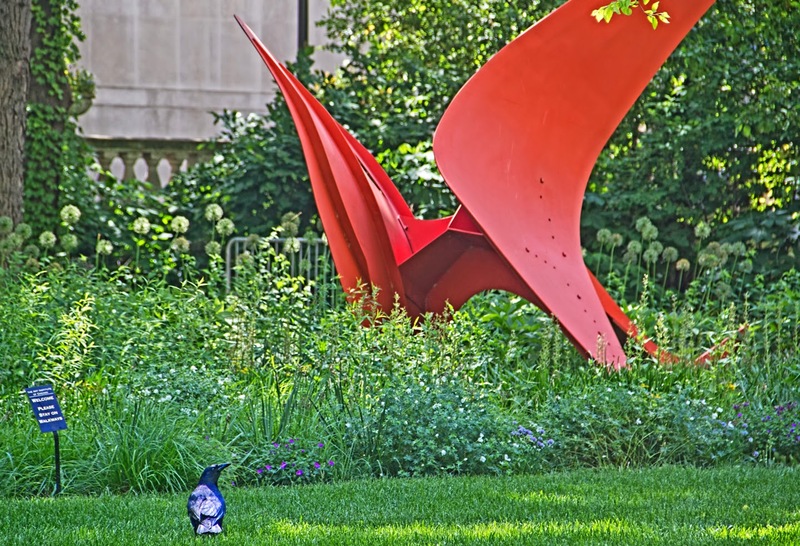 But here's a crow regarding a Calder sculpture outside the Art Institute this morning. 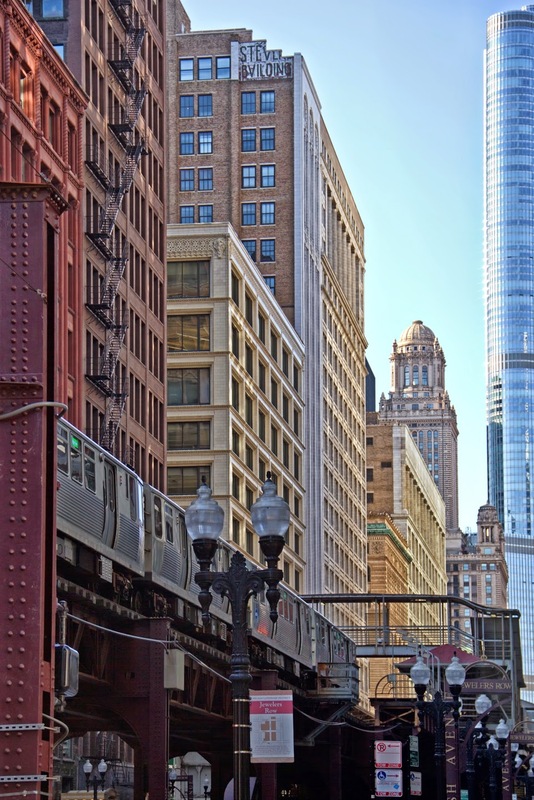 Every city is full of contrast, but one of the things that has fascinated me here is how rundown and even decrepit the train tracks and stations are -- rusting rails and peeling paint running past a billion dollars worth of real estate. New York's are just as bad of course, but since they're mostly underground, it doesn't have the same effect. 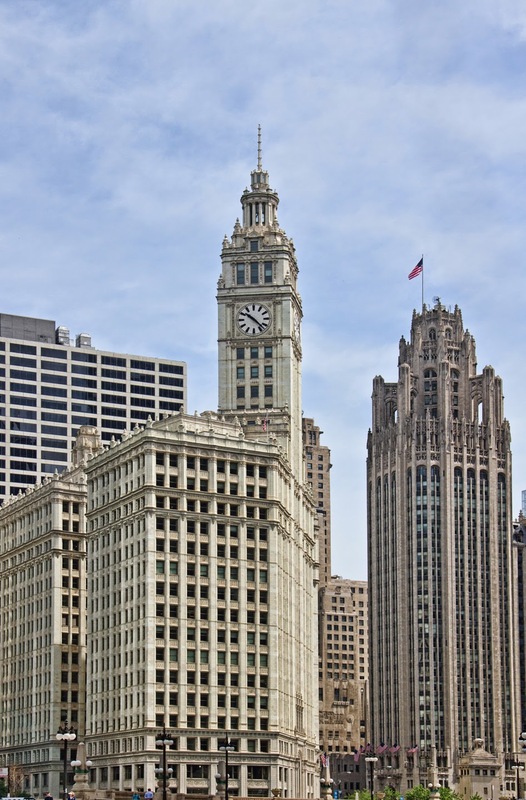 I have enough pictures of Chicago architecture to keep me posting for the next year. 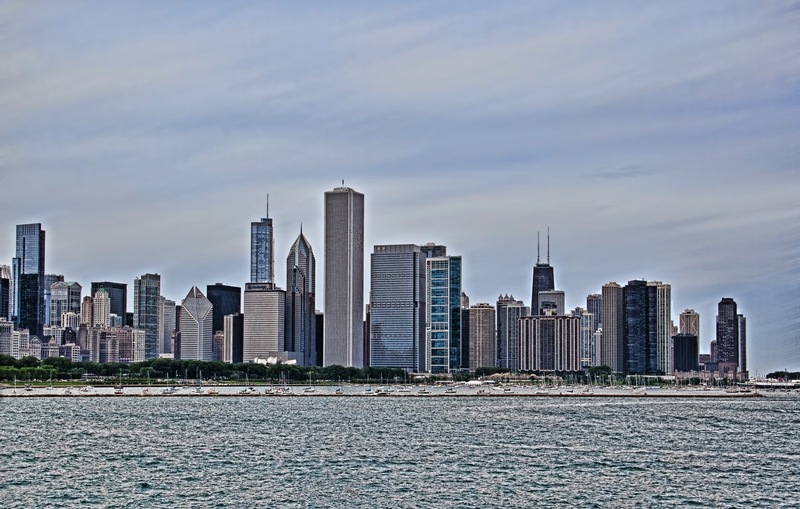 So here's everything at once: the beautiful skyline on the lake. 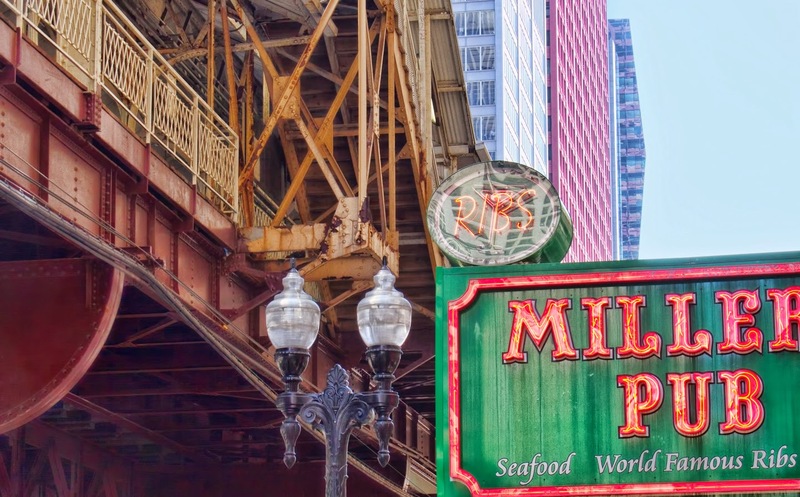 Because a city whose culinary claim to fame is pizza can't be serious all the time. I have no idea what this building is. 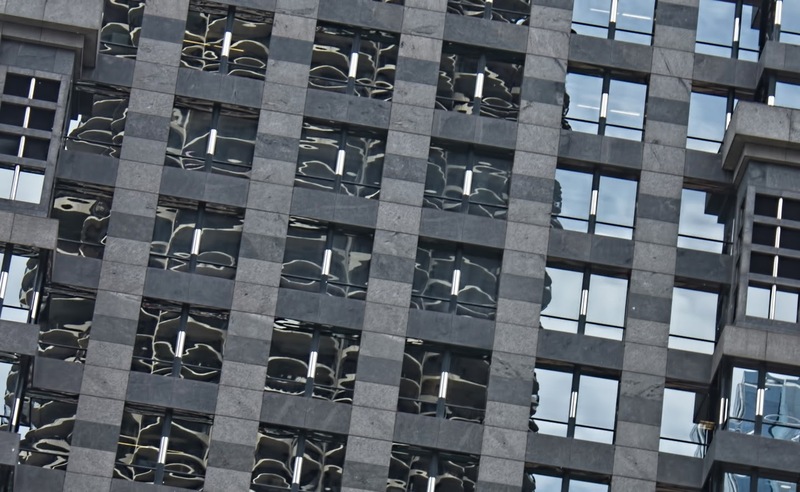 I found it in the background of one of my many pictures of famous modern towers, hiding like an Easter egg in a software program. I love those statues. 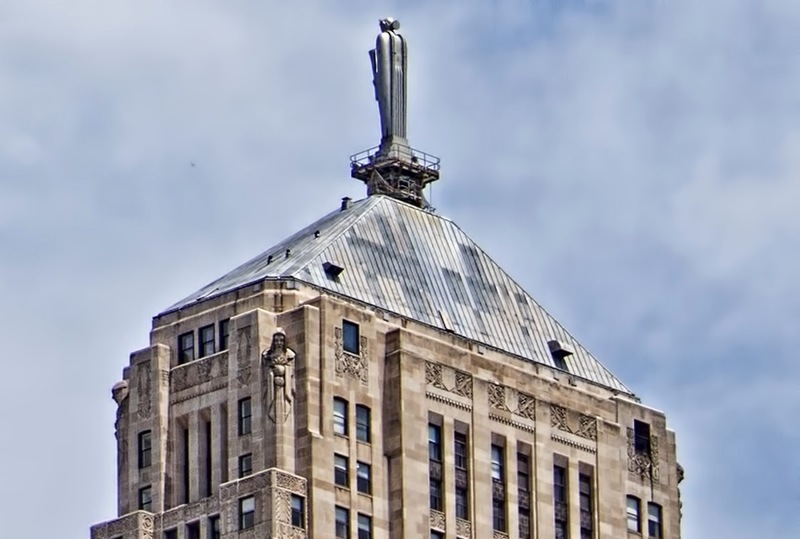 Updated: This is the Chicago Board of Trade building and that is a statue of Ceres, goddess of grain, on top. I remember hearing about this on the tours, but somehow I neglected to give it its own picture. 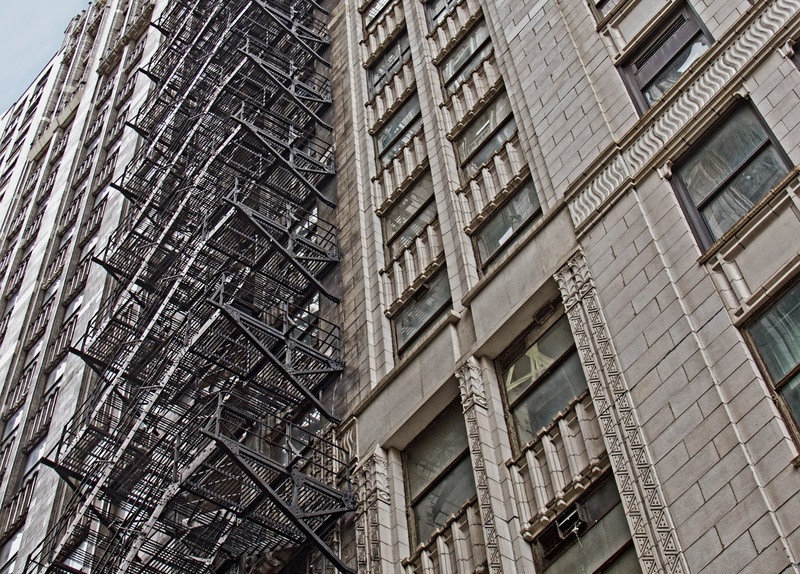 There could be (maybe there is) a tour just of the fire escapes of Chicago. 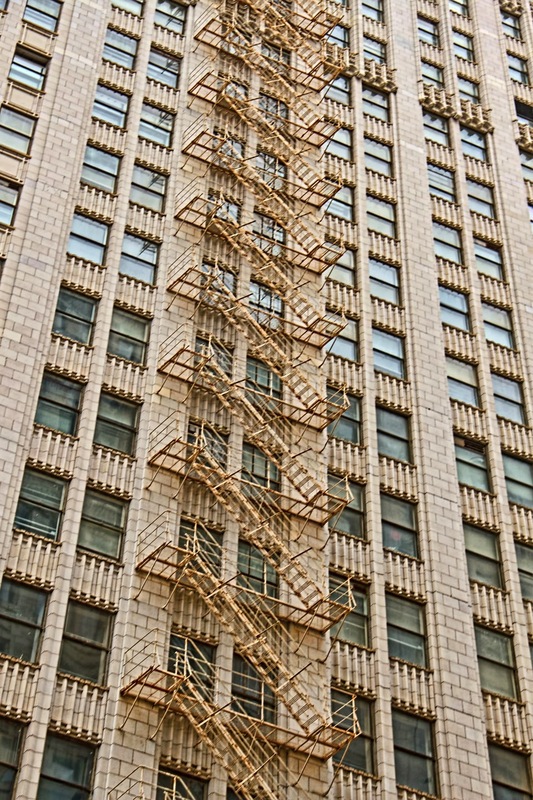 In New York, there are rarely external fire escapes on buildings taller than six or eight stories. Only the prospect of imminent death by fire could get me on one of these. 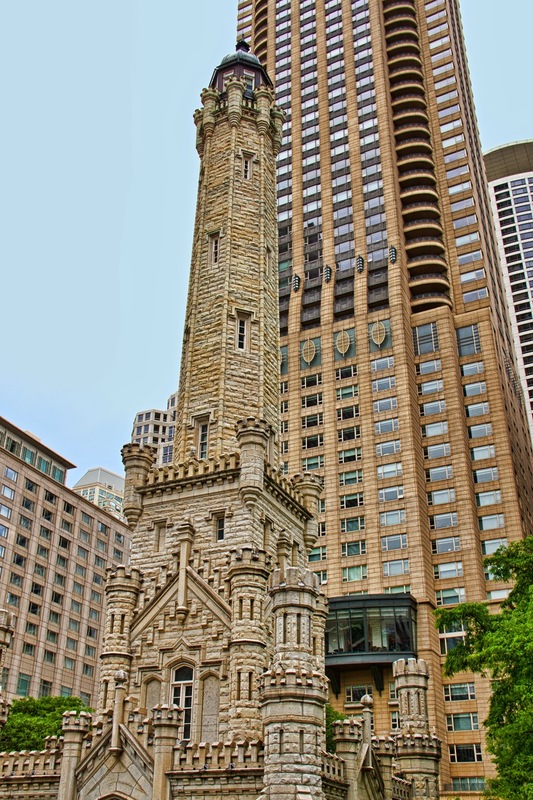 In the middle of the glass towers and high-end retail of the Magnificent Mile, you have this -- the old Chicago Water Tower. Oscar Wilde reportedly called it a "castellated monstrosity with pepper boxes stuck all over it," and while I'm not sure why Oscar Wilde was even aware of its existence, he may actually have been too kind. There certainly is a lot going on for a not very large building -- I'm not sure all of those turrets were absolutely necessary, for example. Sleek it is not. 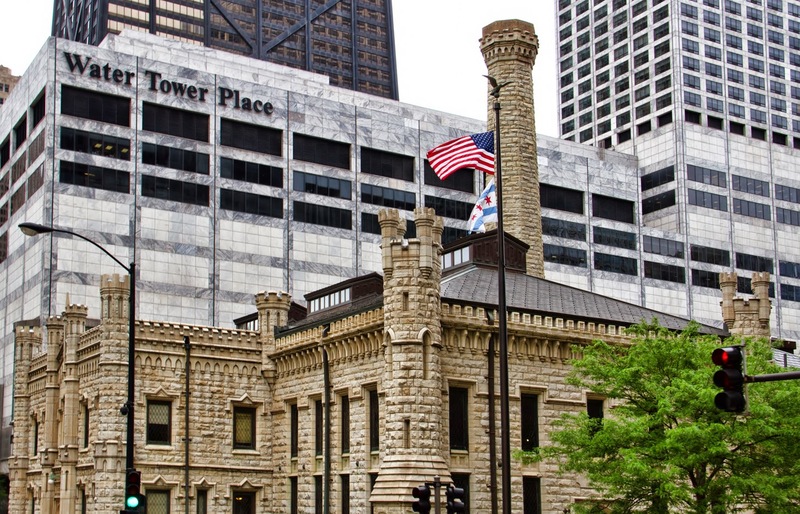 But because it's made of limestone, it's one of the few structures that survived the great fire, and so it's interesting historically, and loved as a symbol of the city's recovery and rebirth. But it reminds me of a papier-mâché castle in a grammar school play. 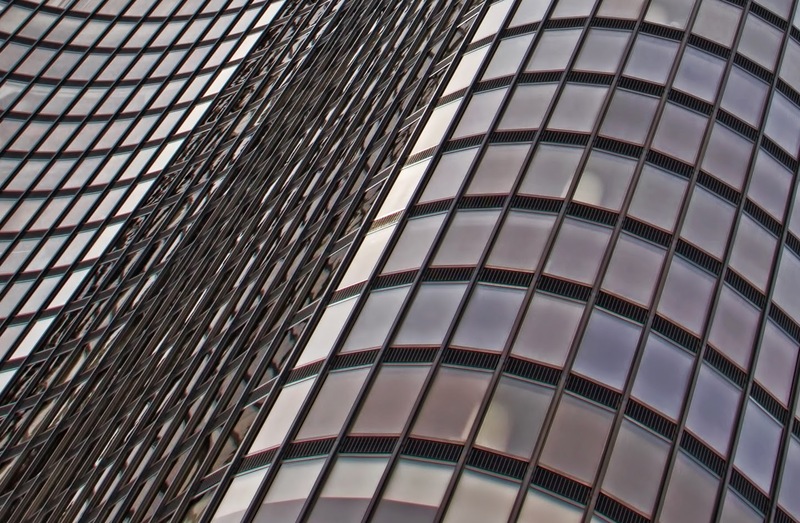 Before Mies decided that curves were altogether too pleasing to the eye and had to go, Mr. "Less is more" designed a building very much like this one, which was executed many decades later after his death by two of his proteges. 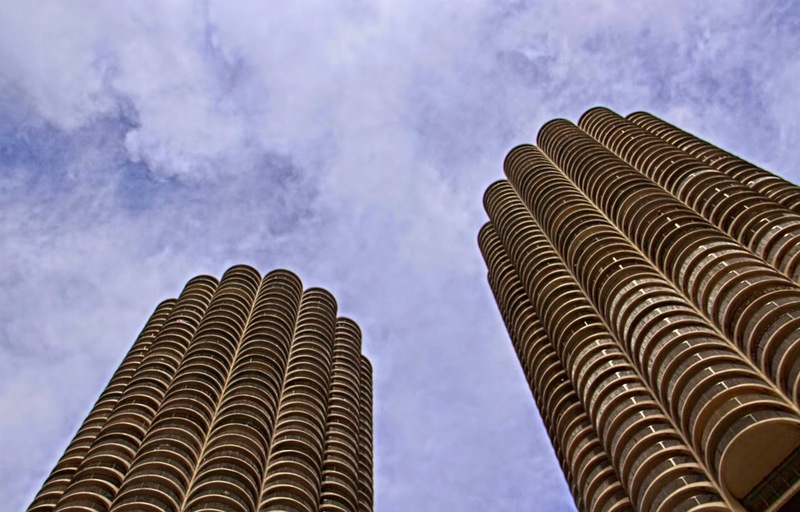 It's the only building on the lake side of Lake Shore Drive. 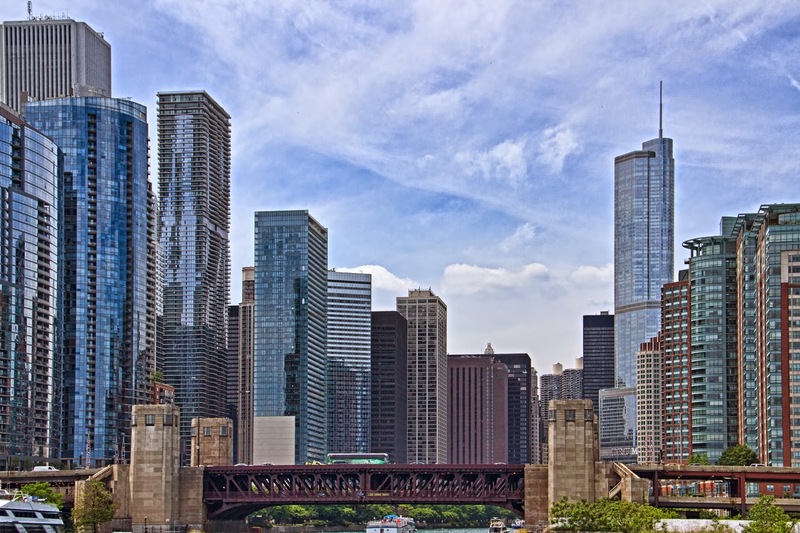 Chicago has very strict protections about building on the lakefront, so it's likely to remain that way. I like this closeup view, with the curves and lines almost abstract. 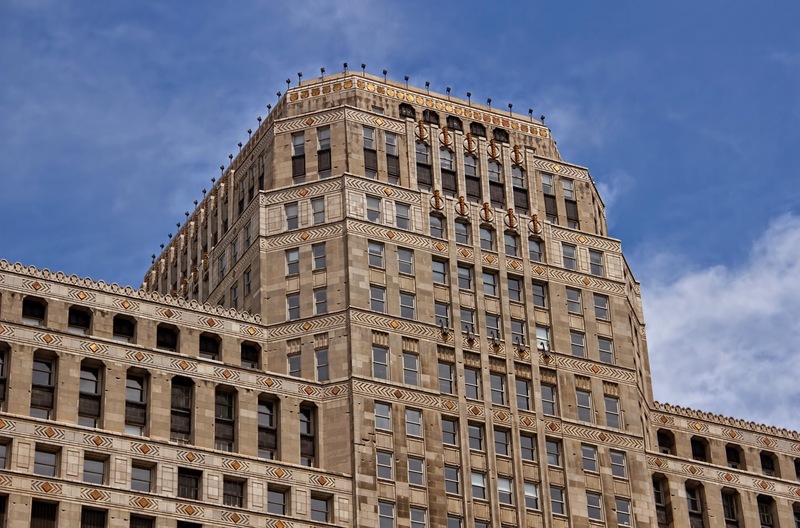 This Art Deco behemoth was built by the retailer Marshall Field in 1930, and with over 4 million square feet of floor space, it was at the time the biggest building in the world. But all those decorative flourishes just look so wrong to me. 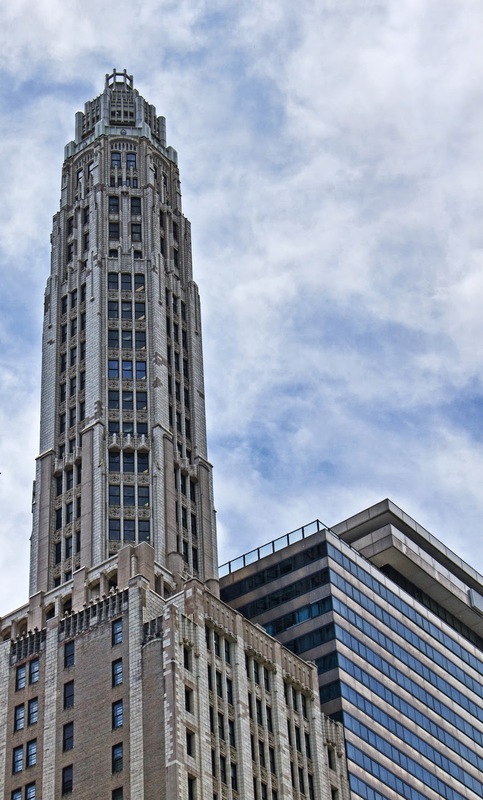 Art Deco architecture usually emphasizes the verticality of buildings, and applied to something so huge and so horizontal it just looks silly. Vertical stripes are not as slimming as we sometimes convince ourselves they are. 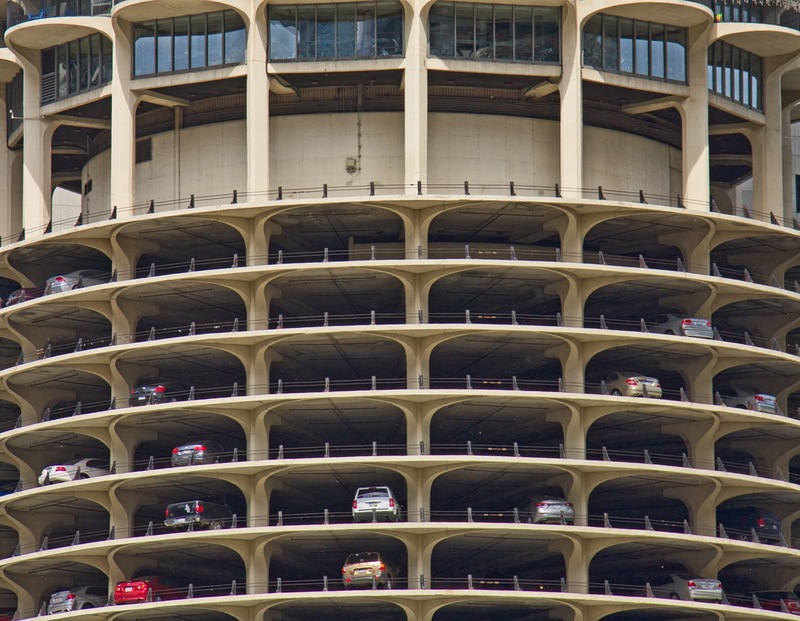 Bertrand Goldberg's Marina City: parking on the lower levels, condos on the top, and every wedge-shaped living room and bedroom gets a balcony. 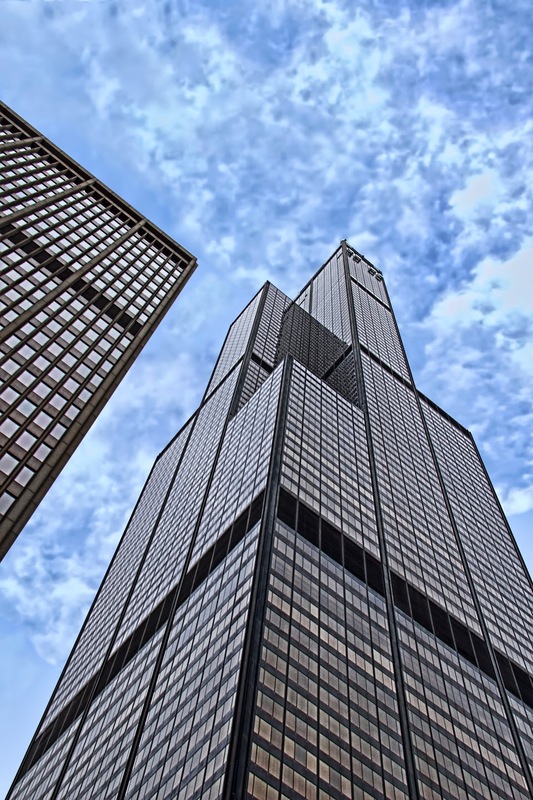 That's Willis Tower on the left, formerly known as Sears Tower, before hard times hit the retail industry, and also formerly the tallest building in the world. The structure was supposedly inspired by cigarettes sticking out of a pack: different heights, and when bound together, much stronger than any of them separately. 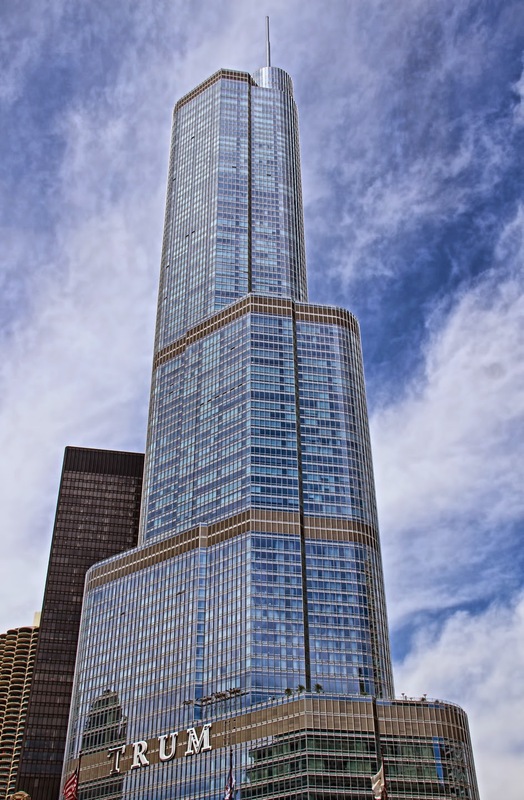 Strong enough to be, at least for a while, the tallest building in the world. 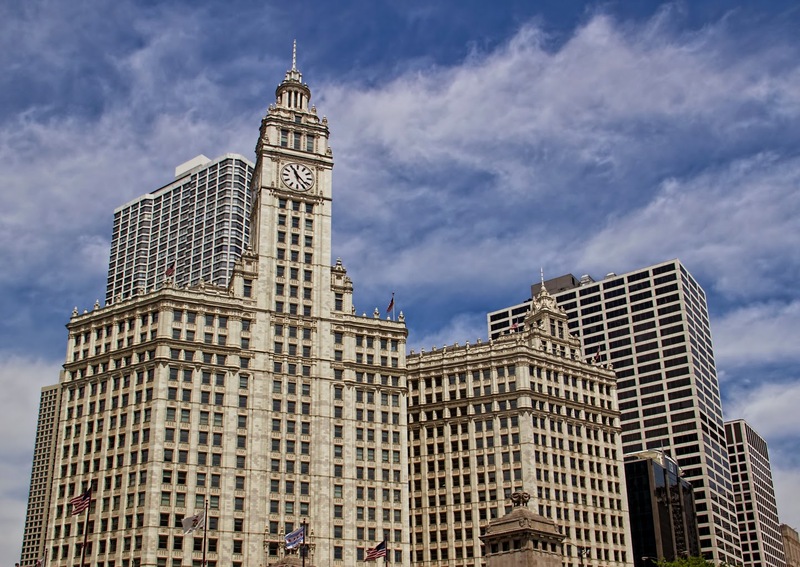 Yes, I have many many pictures of architectural gems, mainly taken from the river. 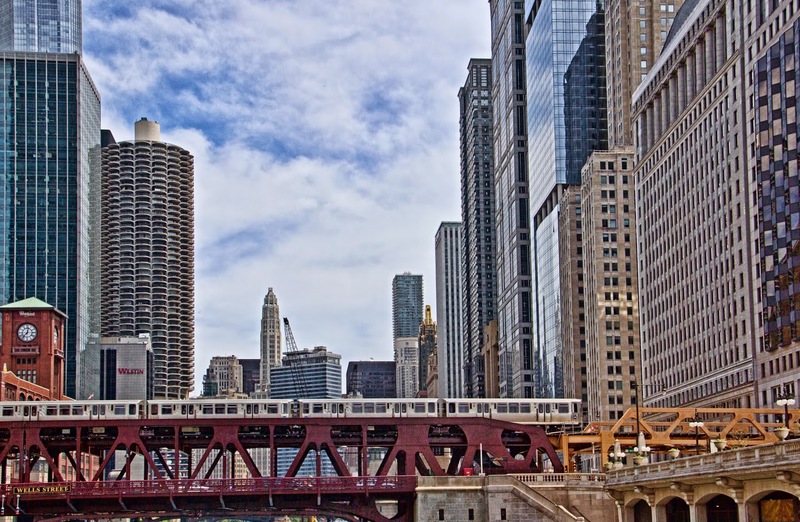 Although I knew vaguely that there was such a thing as the Chicago River, I hadn't known that there are three branches to it, and you can see much of the city from a comfortable seat on a river boat. It's also a great vantage point for dramatic photos. 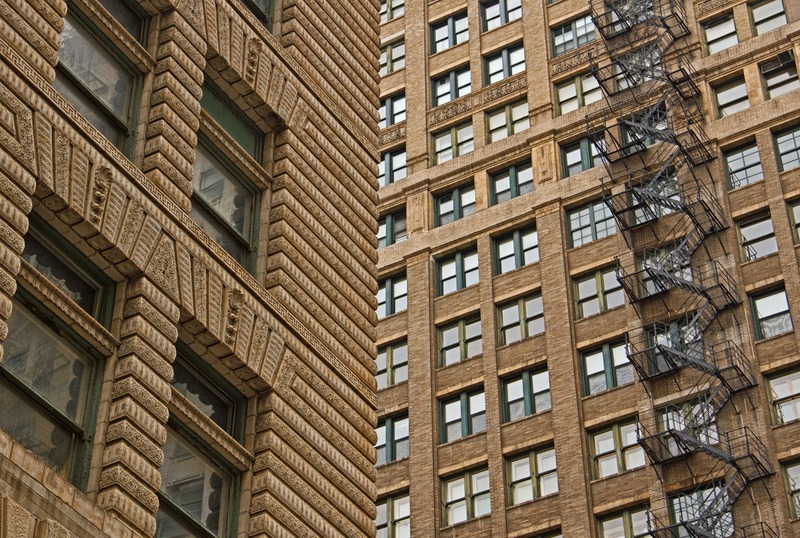 Lots of Art Deco. And Art Deco revival. 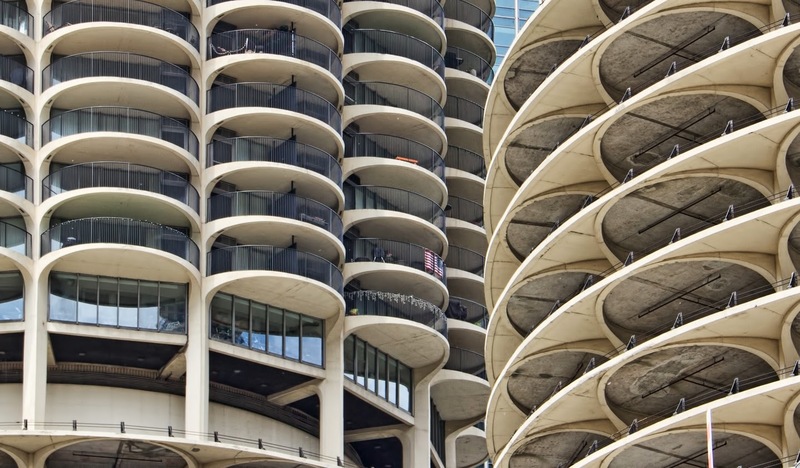 Lots of International Style, Mies van der Rohe and his wannabes. Some ornate limestone structures that survived the great fire of 1871. I took the picture on the left before going on the tour. 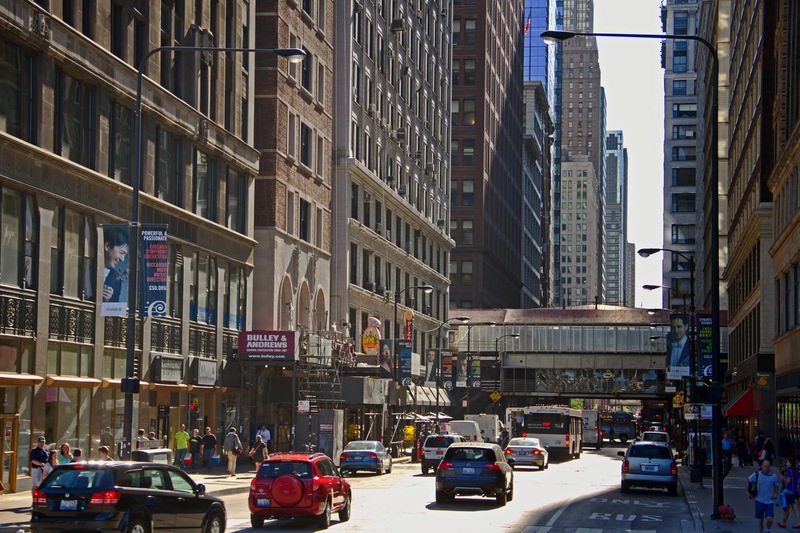 That's the view down Wacker Drive (my new second-favorite street name) towards the Wrigley Building. 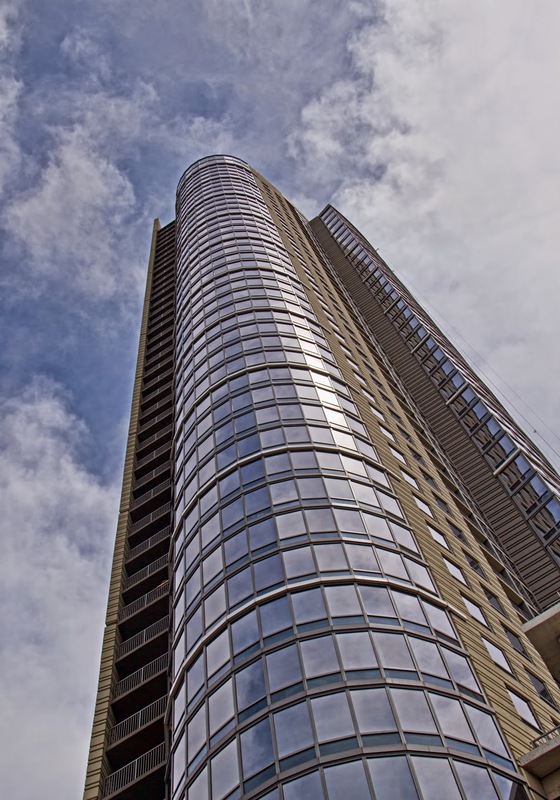 The front of the building, taken from the river, is below. I wasn't looking for a long-term relationship here, just a weekend fling. 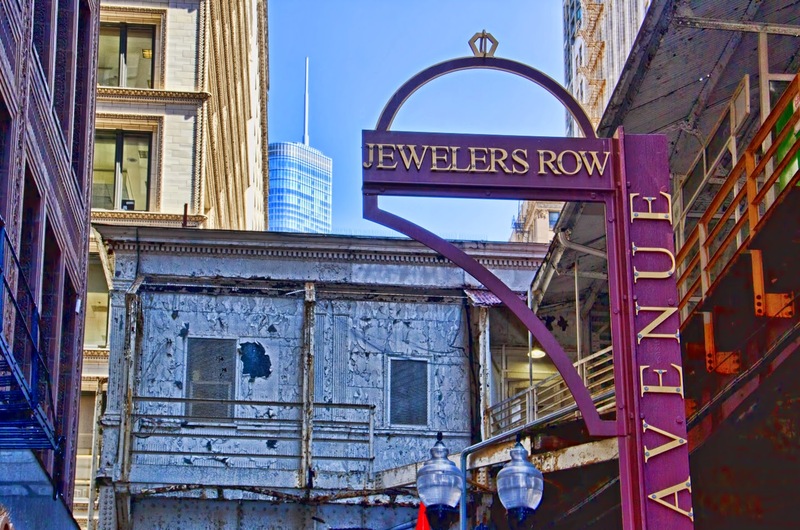 But I had realized before I got here that I had very little sense of what Chicago actually looked like on the ground. Except for the park, that didn't change much yesterday. In the way new places often do, it mostly reminded me of other cities. New York, of course, but also San Francisco, and (surprisingly) Glasgow. Today I really looked around. 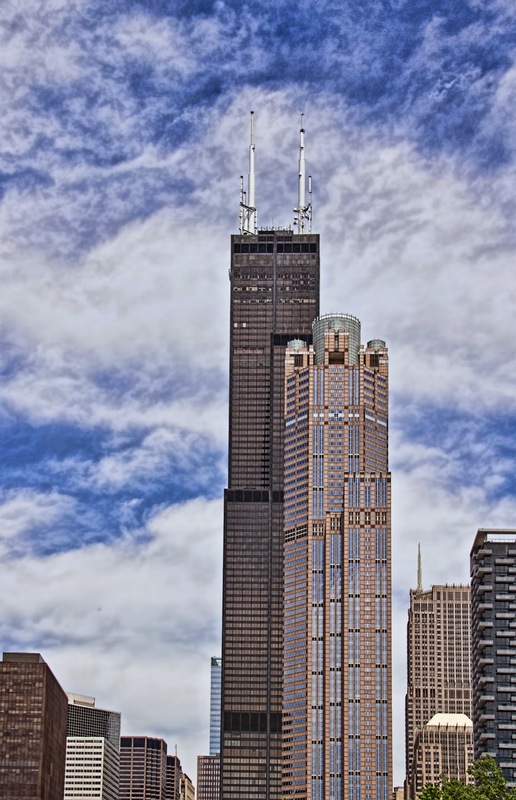 I took an architecture tour on the Chicago River this morning, had lunch outside at a cafe on the Riverwalk, then spent much of the afternoon riding around on a hop-on, hop-off bus. It's a beautiful city. Even if there's no long-term commitment in our future, I would definitely want to spend some more time here. 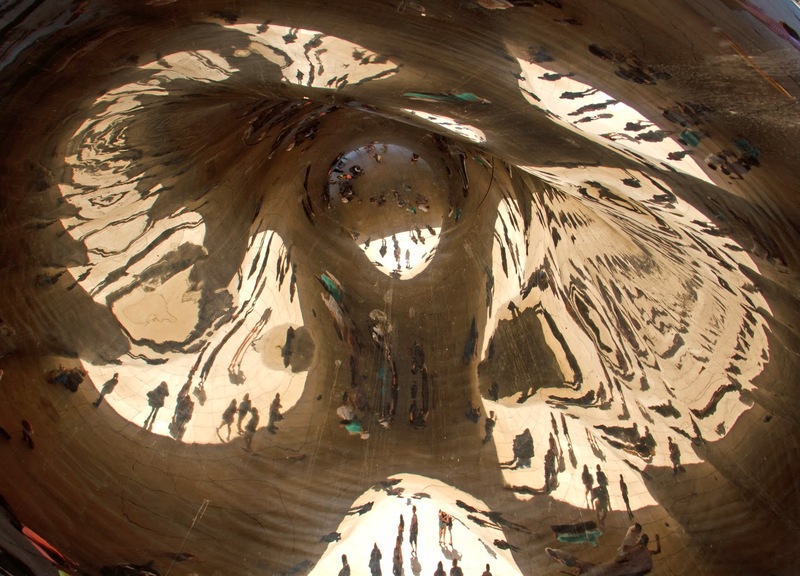 Underneath the Bean, the curves converge into a navel that collects and distorts all of the reflections. 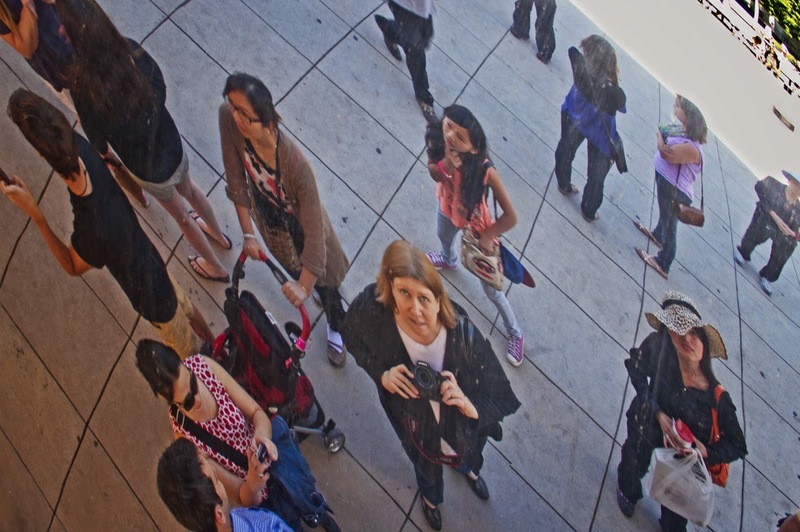 The figures almost look like cuneiform, or hieroglyphs -- or would, if they weren't being reflected in 21st century seamless stainless steel. Plus a Bean selfie of the birthday girl. 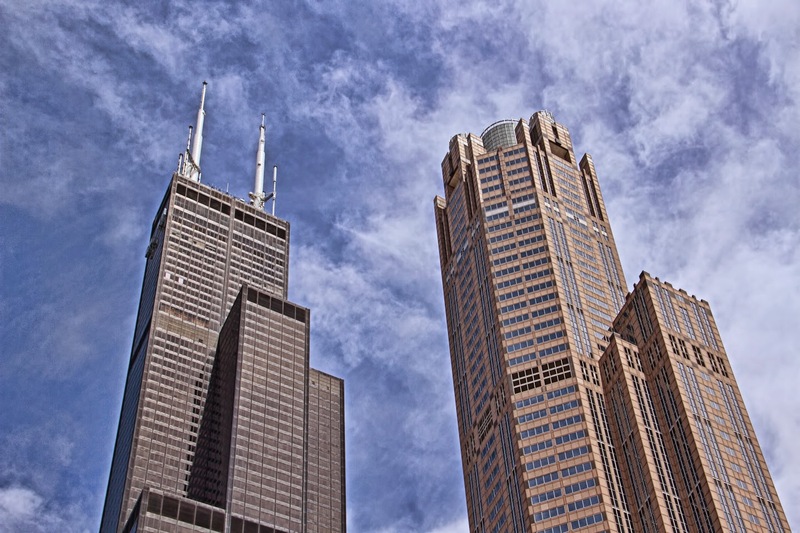 City of the big shoulders. And balconies.